Everyone is welcome to come to this joyful family service. 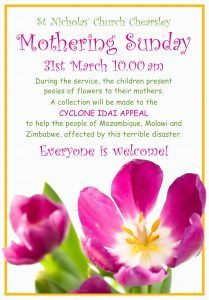 If you would like to help to make posies on Saturday 30th March please join Joy at her home – 1 Bernard’s Close from 2.00 pm. Any donations of small flowers and foliage would be greatly appreciated.